Every company has a reason for being. Here’s ours. I was always interested in healthcare. In fact, at several times throughout my life, I considered going back to school to become a physician. The timing was never right; first as a marketing executive for a utility company and then as a mother of two young children. So, I started doing some research—how could I become involved in healthcare, but use my marketing and sales skill sets? The answer was physician recruitment. After over a decade working at two of the largest healthcare recruiting firms in the nation, I realized I wanted to provide top-tier service to healthcare organizations throughout the U.S., no matter where they were located. I was dedicated to premium client service and had (and still have) a soft spot in my heart for rural communities. Why? The obstacles faced by healthcare providers and patients in rural areas are vastly different than those in urban areas. Economic factors, cultural and social differences, educational shortcomings, lack of recognition by legislators, and the sheer isolation of living in remote areas all conspire to create healthcare disparities. The patient-to- primary care physician ratio in rural areas is only 39.8 physicians per 100,000 people, compared to 53.3 physicians per 100,000 in urban areas. This uneven distribution of physicians has a clear impact on the health of the population, and I wanted to do something about it. Thus, Jordan Search Consultants was born. 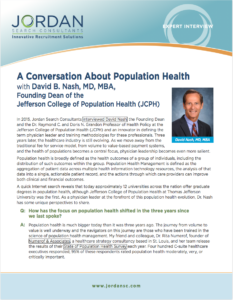 Back in 2003, I knew what type of company I wanted to create—a resource for healthcare organizations that they could truly count on to help strategically solve recruitment and retention challenges. Today, I’m proud to say that vision hasn’t wavered. Whether Jordan Search Consultants is providing healthcare professionals with fulfilling jobs, communities in need with top shelf clinicians, or my fellow big-hearted recruitment professionals with the opportunity to make a difference, our reason for being is clear. We are here to help. 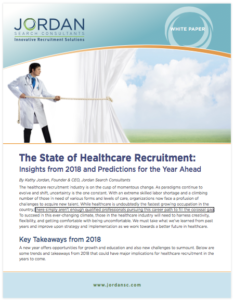 For more information on physician recruitment, executive search, or higher education recruiting, contact Jordan Search Consultants at 866-750-7231 or email us.